Glamifornia is all about events. Well, we’re all about beauty and wellness, art and fashion. And all four of those elements often converge in special celebrations. You know all about our First Friday events, where we regularly feature local artists, trunk shows, beauty extensions (lashes anyone? ), and more. For November only, we’re also having a First Wednesday event. 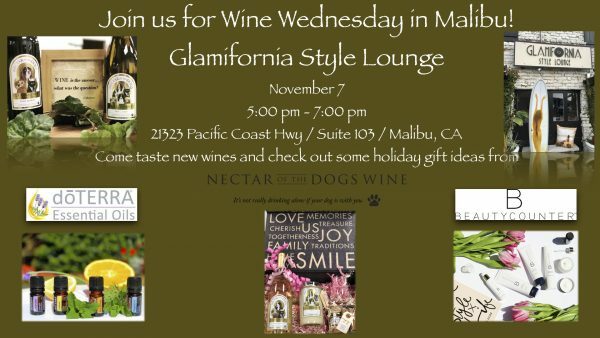 On Wednesday, November 7, Nectar of the Dogs, a local winery, will be on hand for an exclusive wine-tasting. Join us at the GSL, from 5 – 7 pm. Wine. doTerra Essential Oils. B Beauty Counter. And other great new holiday gift ideas. Come and sip chardonnay, sauvignon blanc, cabernet franc, a red blend, and a rose. And shop. Ruff!